The summer months mean more opportunities for you and your family to be outdoors, enjoying the sun, water and fresh air. Bringing your dog along with you to the park, the beach and other areas is part of the fun of these summer days. But warm-weather activities can pose special dangers for your dog. You can ensure a safe and happy summer with your canine companion if you keep these tips in mind. It’s important to keep in mind that dogs cannot sweat like people do to cool themselves. Dogs must rely on panting to lower their body temperatures, and they can only sweat through their paw pads. Limit the amount of time your dog is outside in very hot weather and make sure they have plenty of fresh water available. Monitor your dog’s behavior to detect signs of heatstroke, such as rapid heart rate, nausea, drooling, confusion, lethargy or diarrhea. Take the animal to a cool area immediately and apply cool compresses to lower the animal’s temperature. Seek veterinary care immediately, if needed. 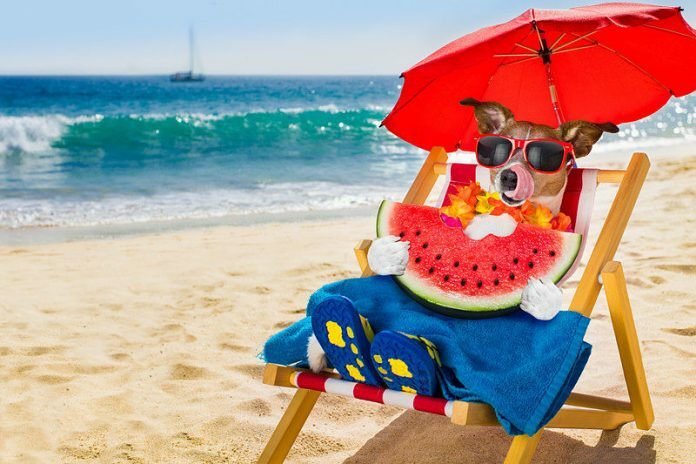 A thick coat will protect most dogs against ultraviolet rays of the sun, but if your dog has a thin, short coat or sensitive, pink skin, they will be more vulnerable to sunburn. Apply sunscreen that is suitable for children in an SPF level of 30 to 50 to ear tips, tummy or other areas. If your dog becomes sunburned, apply cool water to the burn and aloe vera lotion to soothe the skin. If the burn is severe, see your veterinarian for treatment. Some dogs love jumping into the water, playing fetch and romping in the surf. Although this activity is a great way to cool them in hot weather, swimming can be quite tiring for dogs, especially in hot weather. Allow your dog to enjoy water activities for a period of time, and then take them back to a shady area to rest and recover. The summer months are also peak season for fleas and ticks, which can make your dog miserable and transmit diseases. A variety of flea and tick prevention products are available to prevent these pests. You can choose from flea-and-tick collars, powders, sprayssprays and spot-on treatments. You can even make your own homemade flea control shampoo. Oral medications are also available to prevent infestation by these pests. Heartworm is an internal parasite that is transmitted through the bite of an infected mosquito, and an infestation is a serious condition that can threaten your dog’s life. Your vet can provide monthly heartworm medications that will prevent your dog from acquiring this serious health problem. Some oral flea-and-tick medications also include heartworm prevention drugs. Your vet can advise you about the best parasite prevention medications for your pet. Dog owners should avoiding leaving their pets in the car whenever possible. This rule is especially important in the summer when temperatures can heat up quickly. Even when the exterior temperature is a cool 72 degrees, the interior of your car can reach 116 degrees. Never assume that it is cool enough in the car in summer, even if you leave the window cracked open. You may be unavoidably detained, leaving your dog in a life-threatening situation. Animals can suffer irreparable brain damage or death from being left in a hot car. If you run an errand and can’t take your dog inside with you, hold off the errand for another time. Many dogs have a problem with the noise, rumbling and vibrations of the fireworks display that are a common feature of summertime festivals. These animals may tremble, pant, pace nervously or hide in closets or under furniture when distant fireworks are heard. If your dog becomes upset when he hears the distant booms of fireworks, try to be at home with him to reassure him. Some dog owners board their pets in a kennel further away from the fireworks noises. If the animal’s reaction is severe, you may wish to talk to your veterinarian about medications that can help calm them. Summer’s heat and sunshine pose extra problems for both people and their canine companions. If you keep these tips in mind, you will ensure you and your dog share many happy times during the summer months.